I have been tracking the building of our new Manabigama Kiln here at the University of Louisville. In Part One I discussed the basics design and some of the process of building. In Part Two I explained the building of an arch. Those were the first two weeks, with Todd Burns, Reese Salmon and myself primarily working 12 hour days, 6 days a week. Other students came in occasionally, and although we could definitely have used more help, the kiln would never have gotten done without them. During week three, I took a much needed vacation up to Wisconsin to reset my brain before the school year kicked in. Todd and Reese powered on for another gruesome week of hard labor in high heat. The flash flood that occurred on campus turned our whole inside studio into a biohazard, as sewage backed up a full two inches deep throughout the building! As I write this about 2 months after the event, the building is still not quite back to normal yet. After the arch was finished, we built the chimney. With several corbels, it was tricky, but went quickly nonetheless. After that, we made the insulative coating, made of two inches of kaowool and a 1000 pounds of hand mixed combination of 1 part portland cement, 1 part fireclay, 3 parts sand. this took much longer, was much messier, and harder than we had anticipated. In the places where we did not hustle enough, there are now cracks that have formed. The fence material used as rebar ended up wanting to poke through in places. It was a clumsy process I’d rather not experience again. After the coating went on and set, Todd and Reese finished the chimney. A long and arduous process of lifting hundreds of bricks up a ladder to the roof began, and after a few days, they got the chimney complete. 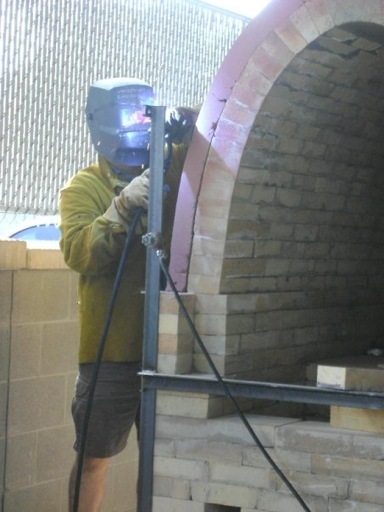 Once that was done, the whole kiln got reinforced with steel angle iron. 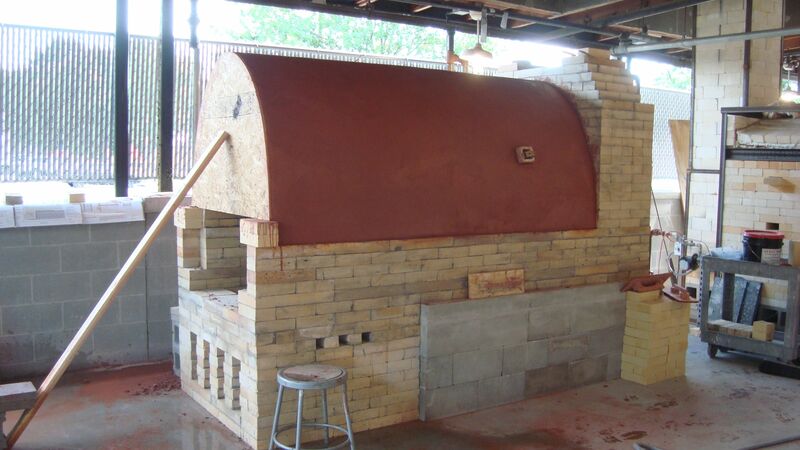 Here’s a few pics of what the finished kiln looks like from a few angles.